For a while she was engaged to Samuel Chapman, a chemical engineer from Boston, breaking off her engagement on November 23, 1928. During the same period, Earhart and Putnam had spent a great deal of time together, leading to intimacy. George P. Putnam, who was known as GP, was divorced in 1929 and sought out Amelia, proposing to her six times before she finally agreed. After substantial hesitation on her part, they married on February 7, 1931 in Putnam's mother's house in Noank, Connecticut. Earhart referred to her marriage as a "partnership" with "dual control." 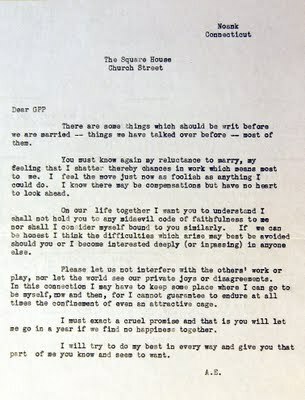 In a letter written to Putnam and hand delivered to him on the day of the wedding, she wrote, "I want you to understand I shall not hold you to any midaevil ([sic]) code of faithfulness to me nor shall I consider myself bound to you similarly." Amelia's ideas on marriage were liberal for the time as she believed in equal responsibilities for both "breadwinners" and pointedly kept her own name rather than being referred to as Mrs. Putnam. When The New York Times, per the rules of its stylebook, insisted on referring to her as Mrs. Putnam, she laughed it off. GP also learned quite soon that he would be called "Mr. Earhart. "There was no honeymoon for the newlyweds as Amelia was involved in a nine-day cross-country tour promoting autogyros and the tour sponsor, Beech-nut Gum. Although Earhart and Putnam had no children, he had two sons by his previous marriage to Dorothy Binney (1888–1982), a chemical heiress whose father's company, Binney & Smith, invented Crayola crayons: the explorer and writer David Binney Putnam (1913–1992) and George Palmer Putnam, Jr. (born 1921). Amelia was especially fond of David who frequently visited his father at their family home in Rye, New York. George had contracted polio shortly after his parents' separation and was unable to visit as often. A few years later, a fire broke out at the Putnam residence in Rye and before it could be contained, destroyed much of the Putnam family treasures including many of Earhart's personal mementos. Following the fire, Putnam and Earhart decided to move to the West Coast, since Putnam had already sold his interest in the publishing company to his cousin Palmer, setting up in North Hollywood, which brought Putnam close to Paramount Pictures and his new position as head of the editorial board of this motion picture company. Amelia met George in May 1928 when he interviewed her about the transatlantic flight on which she was scheduled to be a passenger. George later became the publicist for a book she wrote. George reportedly proposed marriage to Amelia several times before she said yes. One source writes that George proposed six times. Amelia and George were married at his mother's home in Noank, Connecticut at noon on February 7, 1931. Amelia was 32 years old and George was 42 years old when they married. A friend of the family, Probate Judge Arthur Anderson of Groton, Connecticut, performed the five minute wedding ceremony. The word "obey" was not included in their wedding vows. The New York Times reported that "The only witnesses were Mrs. Frances Putnam, Mr. Putnam's mother; Charles Faulkner, his uncle; Robert Anderson, the judge's son, and twin black cats." Amelia wore a brown suit with a light brown blouse, and brown shoes. Amelia's wedding ring was a plain platinum ring. There was not much preparation for the wedding and there were no flowers. Due to a previously scheduled cross-country tour, George and Amelia did not have a honeymoon. Amelia kept her own name and believed in spouses sharing responsibilities equally. Amelia and George did not have any children. George had two sons from his previous marriage. David Binney Putnam: Born May 20, 1913 in Oregon. David was an explorer and writer. He died in 1992. George Palmer Putnam Jr: Born May 9, 1921 in New York. George and Amelia both enjoyed fishing, travel, swimming, camping, hiking, tennis, golf, and hiking. Amelia: Aviator, spokesperson, and author. George: Book publisher, publicist, explorer, and author. George published two of Amelia's books, managed her public appearances and endorsements, and organized her flights. George and Amelia had several homes: Rye, New York; a small hotel apartment in New York; and North Hollywood, California. George Palmer Putnam (September 7, 1887 – January 4, 1950) was an American publisher, author and explorer. Known for his marriage to Amelia Earhart, he had also achieved fame as one of the most successful promoters in the United States during the 1930s. Guest asked Putnam to find a suitable candidate and he eventually came up with the then-unknown Amelia Earhart. As it turned out, they shared many common interests: hiking, swimming, camping, riding, tennis and golf. 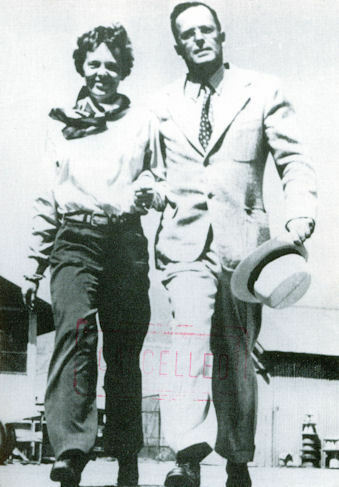 Having divorced in 1929, Putnam spent an extensive amount of time with Earhart, which resulted in an intimate relationship and, in 1931, their marriage. 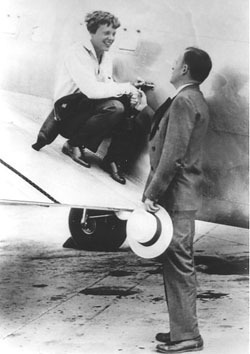 Following Earhart's successful 1932 flight, Putnam organized her public engagements and speaking tour across the United States. Shortly after, he took charge of promoting her career and arranged for endorsement contracts with a luggage manufacturer and a line of ladies' sportswear. In addition, Putnam published two books Earhart wrote about her flying adventures. Earhart disappeared in 1937 while attempting to set another flying record, and Putnam published her biography in 1939 under the title Soaring Wings. 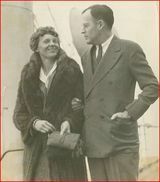 Putnam later donated many of Earhart's belongings, including a flight jacket, to Purdue University, where she had worked as a career counselor. Other personal effects were sent to the Women's Archives in New York.